As the release date nears for Flying Lotus’ excellent Los Angeles, the L.A. producer is using the increased visibility to tout his latest project — Brainfeeder. Brainfeeder is an all-digital outlet for Flying Lotus and other similar-minded producers. He’s managing the imprint alongside influential radio DJ Andrew Meza and rising graphic artist Ques. The first release, Samiyam’s Rap Beats Vol. 1, was serviced to iTunes (with help from Alpha Pup Distribution) in May. As has become the case with digital releases — where the element of surprise is necessary to ward off Internet bootleggers — not much is known about Brainfeeder’s upcoming slate. However, projects are expected from Ras G & the Afrikan Space Program and recent Warp signee Hudson Mohawke. 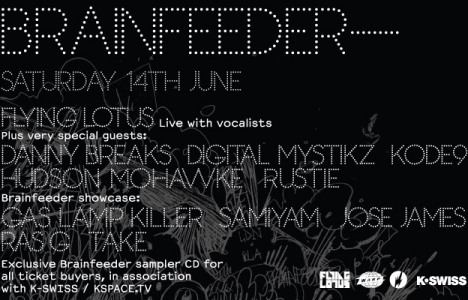 When Flying Lotus holds his Los Angeles release party in London, UK on June 14, he’ll officially launch Brainfeeder with a showcase featuring Ras G, Take, the Gaslamp Killer and Jose James; and a limited-edition sampler CD. More news soon. This entry was posted in News and tagged Brainfeeder, Flying Lotus. Bookmark the permalink.